At the beginning of December I showed you the many projects I was working on. I finished this dress for my daughter (and matching shirt for my son that I'll show you tomorrow) in time to give them as gifts for Hanukkah. The kids wore them for the last night of Hanukkah when we celebrated at our synagogue. While singing the Dreidel song she spun around (the whole time!) and the dress proved to be great for spinning. It has a really full skirt. I'm always amazed at how much fabric going into ruffled things. 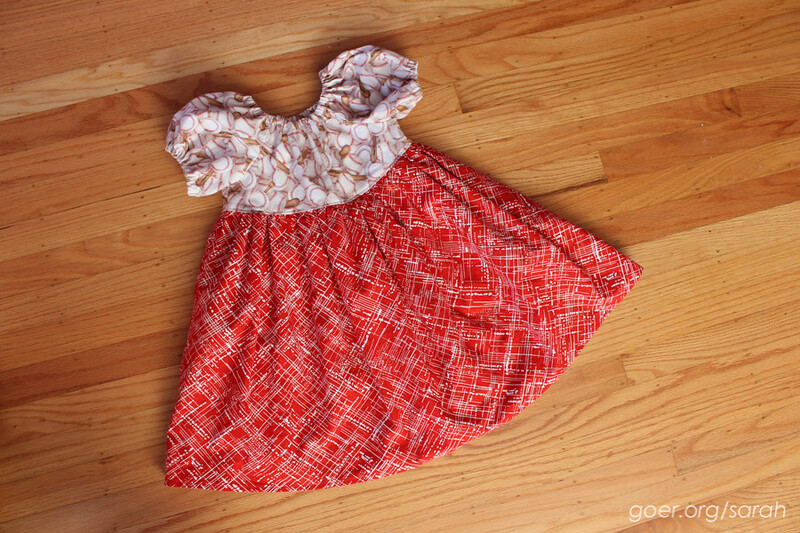 I think the dress I made for her first birthday took 2 yards of fabric. 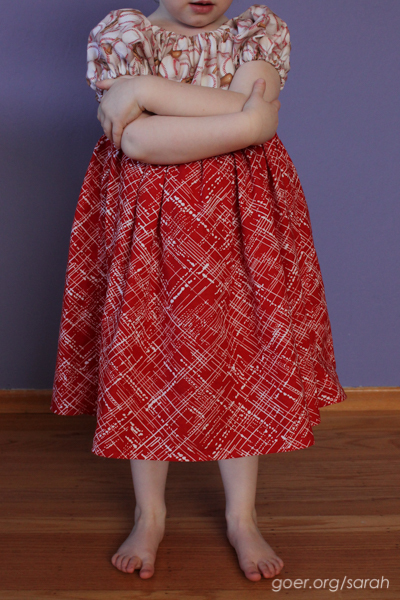 This is the second time I made this pattern, the Jewel's Stripwork Dress by Create Kids Couture. The first one was in summer of 2014 and she's finally outgrown it. 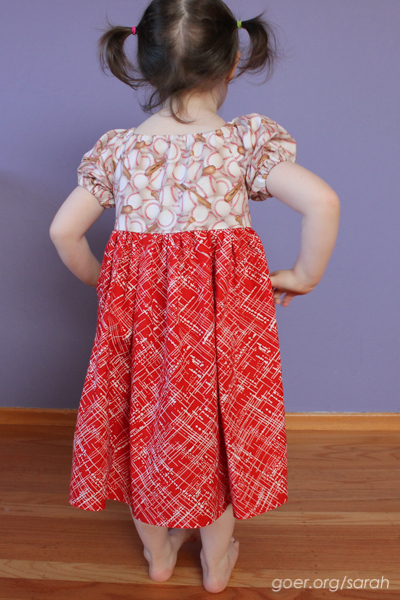 A few months ago when I was fabric shopping with the kids I had a plan to make a new version of this dress. My daughter picked out the baseball fabric and together we found the red to coordinate with it. The pattern goes together very easily. 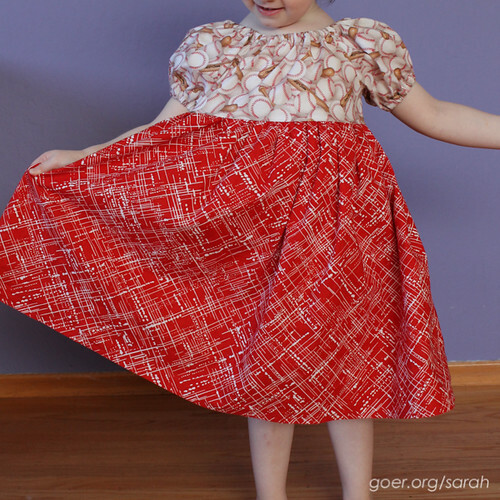 And even faster with just one fabric in the skirt portion. I made the 4T size this time (I think the last one was a 3T) and it's sure to fit her for quite some time. I'm linking up to Adrienne's 2015 Q4 Finish Along post. See all my Q4 goals here. Posted in Kid Stuff, Sewing on December 19, 2015 by sarah. Nothing says fun like a good spinning skirt. I remember wearing stiff slips or tule or net underneath dresses - my sisters and I called them 'stick out slips' and it made the twirling even better. The dress is adorable and so is your sweet girl! My stash is lacking in the red department, so I'm glad to have added this one to the stash. Thanks for visiting, Anja.